There's nothing better than the feeling of smooth skin. Whether it's your legs, your face, or anywhere else on your body silky smooth skin just feels great. I'm not just talking about being hairless, although that's the topic of today's blog. But smooth skin offers less friction, allowing your clothes, makeup, or someone else's hands to glide effortlessly over it for the perception of perfection. Just think about how nice it is to stroke your fingertips over a newborn's skin. I know I find myself lightly grazing my hands over my kids' arms or hands when they are sitting in my lap. It feels nice to hold a silky little palm or foot when playing with little ones. Their skin hasn't been marred yet by life, by dehydration, sun damage, adult hair. It's smooth and perfect. Maybe I'm just a little weird being an esthetician, someone who specializes in the skin. I'm sure it probably makes me hugely biased, but I really do think that smooth skin is a secret (or not so secret!) goal of just about every woman who gives two flips about her appearance. Fortunately, you don't have to spend the day at the spa to get great results. You just have to be willing to invest in the proper products at the start and a little elbow grease to perfect the process. 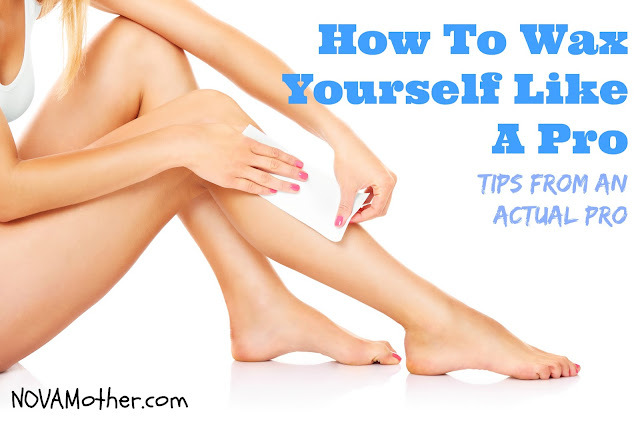 It's much easier than you think, and if you've ever waxed before you're probably already used to the sensation. No pain, no gain. Waxing isn't for the weak, but it does get much better over time. I remember vividly the first time I got waxed, back in esthetician school. Let's just say, half the school must have poked their head into the room at some point to see what on Earth they "were doing to me in there". No, I wasn't quiet about having hair ripped from my body. But now when I go get my legs waxed, I could probably fall asleep during it without a problem. And yes, even though I do this for a living, I still have someone else do it for me on occasion. It's a luxury I am thankful enough to afford when life gets too hectic for me to do it myself. With these tips and tricks, though, you can do it for yourself and get just a good results as if you were going to a spa to have it done. Just remember, practice makes perfect, and it is very important to use the same quality of products as the pros use. You can't expect champagne style with a beer budget or better yet Morrocan Oil results with Walmart brand products. Tip #1: Buy the right kind of wax. Personally, I prefer a cream wax versus a honee wax. I think that the slightly thicker consistency gives me better results and is easier to use. It heats more slowly and doesn't get a runny. I think it's easier to burn yourself with overheated honee wax. That's just a personal preference though. I know a lot of professionals who will swear by honee wax. That's fine, but make sure that you are using a cream or a honee wax on your arms, legs, and face. Underarms and bikini areas with coarse hair do better with a hard wax. That being said, perfect your use of soft waxes before moving on to hard wax. It's much trickier to learn, as it doesn't use cloth strips to remove it from the skin. You allow it to cool and then pull the wax itself off to remove the hair. Please do not ever use the kind of wax you heat in a microwave. I remember seeing an image in school of a girl who tried to use one, and when she reached into the microwave to pull it out, it exploded in her hand. She had severe burns and permanent scarring. Microwaves do not heat the wax properly, meaning slowly and evenly. Tip #2: When applying the wax, use a wooden spatula and hold it at a 45 degree angle. This will give you the right amount of product and help it to glide over the area properly. Tip #3: Spread the wax in a thin even layer. Too thick, and it will be hard to remove. Too thin however, and the wax will adhere more to the skin than the hair and hurt. Tip #4: When applying the cloth strips, don't rub too much. Press firmly along the length of the strip to adhere it to the wax and then pull. Rubbing the area over and over will cause too much friction on the skin and increase the circulation, making it hurt more. Tip #6: Before and after products are vital. It's not just about the wax. You have to prepare the skin properly before so that the wax sticks to the hair and not your skin. Do this by applying the pre-wax cleanser to remove any oils on the skin. I like to dust a little bit of talc-free baby powder over the skin as well as a soft barrier. It will also absorb any sweat or moisture on the skin. This is especially helpful in humid climates or for the creases (ie. underarms and bikini area). After you remove the wax, use the wax remover to remove any wax residue on the skin. They usually contain great skin conditioning agents. There are lotions you can get that sooth the skin or inhibit hair growth as well. If you're going to use a hard wax, you prep your skin with a waxing oil first, not the baby powder. So bear in mind to read the directions for the products before you use them for the first time. If you're looking for the perfect all-in-one waxing kit, check out this one by Satin Smooth available on Amazon.com. It's all the same products I use in my studio, and I love the results. It also comes with a great instructional DVD to get you started. It easily pays for itself within a few uses, depending on where you wax most. Tip #7: Wait until the hair is at least 1/4 inch long before waxing. Any hair over 1/2 inch, trim down. If the hair is too short, the wax won't be able to pull it out. If the hair is too long, the hair will snap instead of being pulled out. The recommended program is every 4-6 weeks. Since hair doesn't all grow at the same rate, it may take a few waxes to get everything on the same page. Tip #8: Apply the wax in the direction the hair grows. Remove the wax in the opposite direction. This will pull the hair out from the follicle properly. Otherwise, it will just snap the hair. Tip #9: Work in small sections for control. Trying to wax a huge area at once will get messy if you're just starting out, and it can cause uneveness. You can apply the wax to larger areas, but stick with removing small sections at a time. It will be cleaner, easier to control, and hurt less. Trust me. Tip #10: Apply pressure to sooth the nerve endings. After ripping the strip off, press on the area lightly with your fingertips to stop the stinging sensation.